The space between the galaxies wasn't always transparent. In the earliest times, it was an opaque, dense fog. How it cleared is an important question in astronomy. New observational evidence from the University of Michigan shows how high energy light from massive stars could have been responsible. Astronomers believed that early star-forming galaxies could have provided enough of the right kind of radiation to evaporate the fog, or turn the neutral hydrogen intergalactic medium into the charged hydrogen plasma that remains today. But they couldn't figure out how that radiation could escape a galaxy. Until now. Jordan Zastrow, a doctoral astronomy student, and Sally Oey, a U-M astronomy professor, observed and imaged the relatively nearby NGC 5253, a dwarf starburst galaxy in the southern constellation Centaurus. 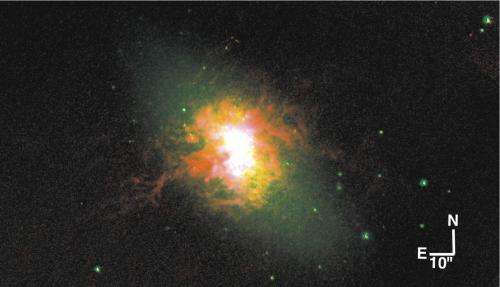 Starburst galaxies, as their name implies, are undergoing a burst of intense star formation. While rare today, scientists believe they were very common in the early universe. The researchers used special filters to see where and how the galaxy's extreme ultraviolet radiation, or UV light, was interacting with nearby gas. They found that the UV light is, indeed, evaporating gas in the interstellar medium. And it is doing so along a narrow cone emanating from the galaxy. A paper on their work is published today (Oct. 12) in Astrophysical Journal Letters. "We are not directly seeing the ultraviolet light. We are seeing its signature in the gas around the galaxy," Zastrow said. In starburst galaxies, a superwind from these massive stars can clear a passageway through the gas in the galaxy, allowing the radiation to escape, the researchers said. The shape of the cone they observed could help explain why similar processes in other galaxies have been difficult to detect. "This feature is relatively narrow. The opening that is letting the UV light out is small, which makes this light challenging to detect. We can think of it as a lighthouse. If the lamp is pointed toward you, you can see the light. If it's pointed away from you, you can't see it," Zastrow said. "We believe the orientation of the galaxy is important as to whether we can detect escaping UV radiation." The findings could help astronomers understand how the earliest galaxies affected the universe around them. More information: The paper is titled "An ionization cone in the dwarf starburst galaxy NGC 5253." I thought it was widely accepted that the only way super massive blackholes at the center of galaxies can form is through super massive stars and huge amounts of material around to be "eaten" by the star and black hole? Think of it this way, if you're really going to talk about SMBH and cosmic time scales. It takes about 10 million years, theoretically, for the shell of an expanding supernova to travel 60,000 light years from the edge of a very large galaxy to the SMBH in the hub. Now the SMBH doesn't absorb and catch the entire shell, obviously, but only a slice of it, but much of teh shell escapes the galaxy and stars, but much of it is also absorbed by other stars, which later explode, and other black holes. Over epic time scales, "slices" of these shells fall into the hub into other stars which explode or the shells of material fall directly into the growing black hole. So galaxies lose mass, but mass they retain gradually concentrates in the growing black holes. Of course, I'm a little unsatisfied by the explaination I give above. I figure in an "isolated" galaxy and excluding galaxy collisions, the above proces could only explain SMBH up to about 1000 to maybe 10,000 solar masses, and 10,000 is a bit of a stretch. Let's say you have a rogue globular cluster, or a "Dwarf Galaxy" with like a million stars. In practice big bumps will have smaller bumps, etc. So one big bump will result in lots of SMBH, and they will be surrounded by stuff. ;-) Instant primordial galaxies with SMBH. My guess is that there are NO SMBH that were not there in the first hour of the Big Bang. Maybe one or two that formed from mergers of intermediate mass black holes, but that is about it.